Since independence Uzbekistan has done quite a significant work in reviving the nation’s spiritual and cultural heritage which includes individuals who played important role in writing the history of world civilization. Amir temur is one individual who was a warlord, politician, reformer, patron of science, education, culture, trade and craft. He played a great role in uniting people and nations and promoted science, education, culture, architecture, fine arts, music and poetry in a huge way during his ruling time. Dedicating to great work of Amir Temur 1996 was declared as the “Year of Amir Temur” in Uzbekistan as it also celebrated 660th anniversary. So in this article we will see about a place in Tashkent, Uzbekistan which is named after the great emperor Amir Temur. This place is good attraction in Tashkent so much so that when you are on Tashkent tour or you have taken Tashkent tour package then you should think visiting this place. But before that we can explore this place a bit. This place is Amir Temur Square in Tashkent City of Uzbekistan. 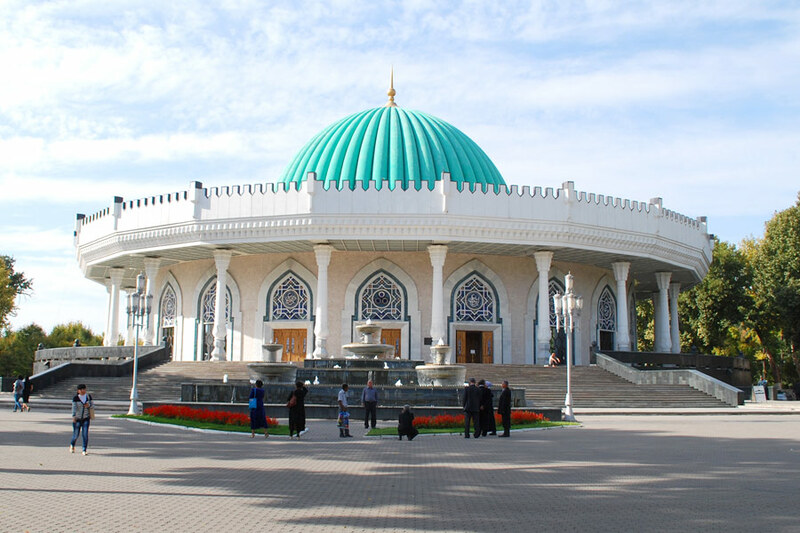 Amir Temur square is in the center of Tashkent and obviously named after Amir Temur. Amir temur square is a Historical place in Tashkent, Uzbekistan. The history of this square goes back to 19th century and the square was a small park in the center of Tashkent city surrounded by buildings of gymnasium for both men and women along with schools and bank. Amir Temur, an outstanding commander and statesman from 14th century is represented through a monument right in the center of the square. So this Monument of Amir Temur in the center of the square is made of bronze figure of Amir temur with imperial regalia on a reared horse. Around this monument earlier there was a small park but after reconstruction in 2009 now there is a small area with fountains and greenery. 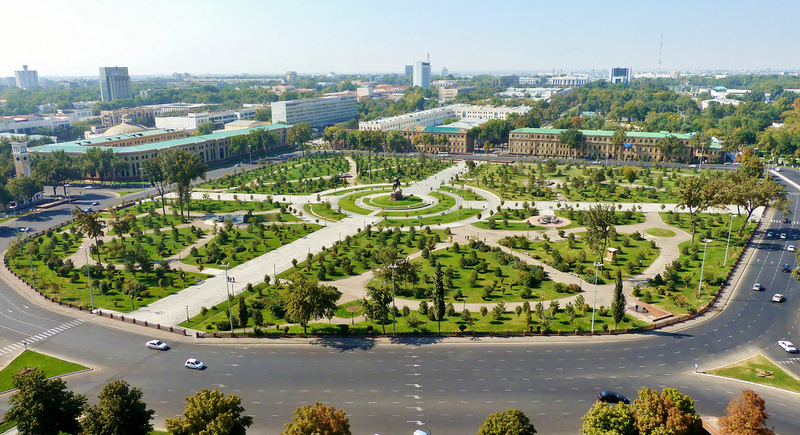 The square is surrounded by the buildings of Uzbekistan hotel, University of law, the Amir Temur Museum, famous Tashkent Chimes and the Forums palace which happens to be one of the most grandiose architectural structures in the city of Tashkent, Uzbekistan. 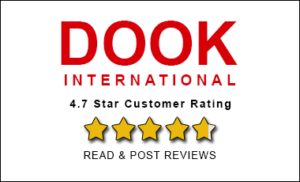 Before you take off after taking Tashkent tour package from India or Uzbekistan tour package from India, you should know beautiful things about the Amir Temur square so that your Uzbekistan tour package becomes absolute value for money. Amir Temur museum around the Amir Temur Square looks beautiful. This museum’s blue cupola looks like Gur I Mausoleum in Samarkand. Museum contains medieval architecture with all modern facilities. So you should visit this museum also as there are more than 5000 artifacts in the museum along with over 2000 objects which are displayed in museum’s exhibit halls. Museum also has collection of utensils, weapons and clothes belonging to the Temur and Temurid epoch. Another place around the square is Forum palace. Forums palace is a place where important state and international events are held. You should be here as the architecture of the palace is quite beautiful. From outside also palace looks beautiful as it is decorated with majestic columns and the dome part is the best thing about the architecture of Forum palace. Height of the dome goes up to 48 m and the peak is crowned with figure of storks. You can spend some good time in and around Amir Temur square. There are buildings of historical importance around the square and among them Tashkent chime is another monument which is quite famous for its architectural beauty. It always has been the symbol of Tashkent. Apart from these historical monuments what else are there for your recreation and enjoyment? Well if you have taken Tashkent holiday package or you are on a Tashkent group package then you want to have good time. You can be sure to get enough entertainment here in and around Amir Temur Square in Tashkent. Near the square you will see cinema theaters and entertainment centers which you can enjoy. These cinema theaters and entertainment centers make the square even more popular. From here you can go to any part of the city. One cannot separate Amir Temur square and modern Tashkent. So when you are on Tashkent tour or on Uzbekistan tour package from India, don’t forget to visit Amir Temur square and surrounding places along with historical monuments which are architecturally very beautiful.